Putting Cable In ImpecCable. 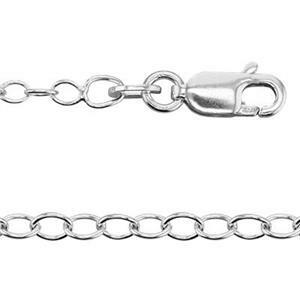 Our 24030L - 30 inch – Opera Length - finished 2.1mm Cable Chain Necklace. Finished with the special added touch of a Lobster Claw! Whether heading out to the opera – or for catching the latest movie at your local theater – this exemplary chain will make the outing all the more memorable. A great length to have on hand in your jewelry supplies. Want to make it – Remark-Cable? Add one of our many Sterling Silver Pendants. These are well made silver chains, high quality and worth every penny for the lobster style clasp.